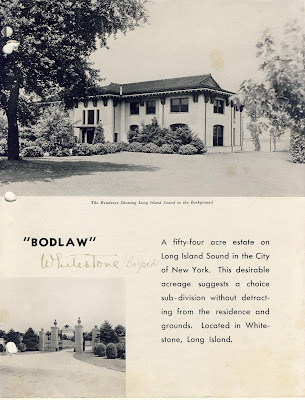 A brochure advertising 'Bodlaw', the William L. Burton estate built c. 1918 in Whitestone. Burton was known as the 'Cypress Lumber King' and was involved in securities trading. 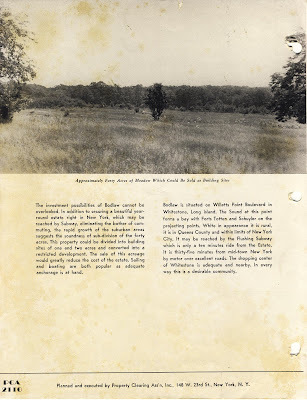 Burton purchased the property around 1916 and spent $500,000 building his house and grounds. 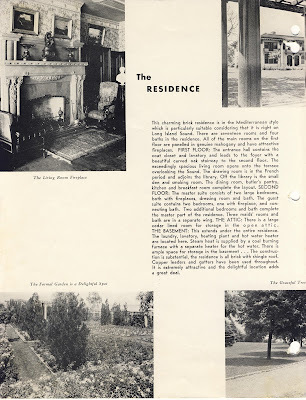 In 1936 the estate was sold for development (most likely the date of this brochure). The developer said he planned to use the main residence as a community house for the incoming development but I do not know if the house still stands. The place sat towards the end of Willets Point Boulevard near Fort Totten. It appears this house is long gone. Probably stood near the off ramps for the Throgs Neck Bridge. There is a road called Burton Street to the West of Totten Boulevard at 14th Road. Interestingly, there is a house where Utopia Parkway, Totten Street and Cryders Lane come together that is not on the grid pattern unlike all the surrounding homes. Could this have been a structure on the estate? It doesn't fit the description of any in the brochure. In the open field to the south there appears to be remnants of a foundation. 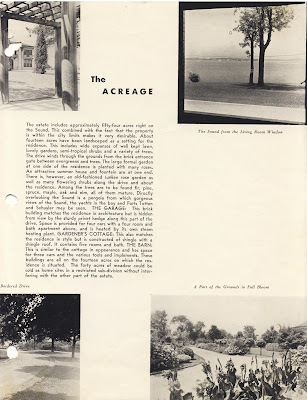 If you look at the view of the water from the house in the brochure (particularly of the far off shoreline) and match it up against the sight lines from this locale it seems plausible the house stood here. On the HISTORIC AERIALS image for this area, there apears to be a rather large estate in 1954 (could this be too late?) where 166th st is now (between 12th and 9th ave) at the curve. There appears to be several large square residential towers in this area now (forgive me, im not in NY)Not sure this is the house, since the house appears to be uncomplicated (footprint-wise) but jumbled on the historic image. oops - must be that big stone place surrounded by high rises right by the bridge- right? - so much for the 5 acre park that surrounded it and looks like area residents that opposed the highrises are gone too.